All GSCCC offices and shops will be closed Monday, May 30 in observance of Memorial Day. Monday-Thursday 9 a.m.-5 p.m. Friday 9 a.m.-1 p.m.
Sunday, June 12 is all about the Kids! Come in uniform and enjoy a day of family fun. Complete an L.L.Bean Passport to win a cool patch! Join the Girl Scouts of the Colonial Coast and Tidewater Council Boy Scouts for hands-on activities and games. 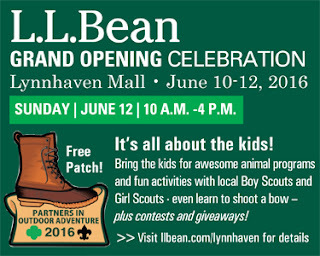 To learn more, visit llbean.com/lynnhaven. Recordings of the recent Volunteer Support Team Webinar Series are available for viewing any time. All recordings can be found on the Service Unit Resources page of the website. For questions contact Christine Duer, Volunteer Services Director, at volunteer@gsccc.org. How Did Your Volunteer Year Go? As summer approaches, many troops and volunteer positions begin to wind down until the start of a new school year. Now is a great time to assess how your year went and whether you received the support you needed as a volunteer. Take a few minutes to complete the End of Year Volunteer Self-Assessment to reflect on your accomplishments and to let us know how your year went. The survey will be available until June 30, 2016. Is there an individual or community organization that you would like to recognize with a Community Award certificate? You can now request certificates at any time of the year. Simply fill out this online form, and you will receive a certificate signed by the CEO within four weeks of request. We can’t wait to...kick off another awesome Girl Scout year! Get your Girl Scout year off to a great start at this FREE event for all volunteers! Stop by The First Tee for fun day with Girl Scouts learning golf skills and taking part in challenges during a Girl Scouts only open house! Clubs will be available for your use, and the golf course and driving range will be open for free play. Meet the staff, enjoy refreshments and have a great time with family and friends. Sign up for The First Tee character educational and life skills classes and/or one-week summer camp sessions during this event and receive a discount! Hook a fish at checkout and receive a 10 percent, 15 percent, or 20 percent discount off the entire purchase. Cannot be combined with any other offer. As part of our 20th Anniversary Celebration of A Place for Girls in Chesapeake, we are offering commemorative bricks. The bricks are available in two sizes: 4"x8" for $100 and 8"x8" for $250. Consider dedicating a brick to your troop leader, honor a Girl Scout or remember someone special in your life. Orders will be accepted until June 30, 2016. The order form is available on our website or contact Robin Thomas at robint@gsccc.org. Calling all Girl Scout alumnae! Sign up for our Amazing Race Alumnae Encampment at Camp Darden the weekend of July 8-10, 2016. GSCCC promises a fun weekend with canoeing, archery, campfires, and much more. Bring your friends and show your Girl Scout spirit by entering the “Bling Your Base Camp” contest. Air conditioned cabins are available on a first come, first served basis. We look forward to seeing you there! For more information, contact Robin Thomas at robint@gsccc.org. Is there an outstanding former Girl Scout in your community who is making the world a better place? If so, consider nominating her for our Girl Scout Famous Former Award. Nominations are being accepted until 4:30 p.m. on Thursday, June 30, 2016. The nomination form is available on our website or available through Robin Thomas at robint@gsccc.org. 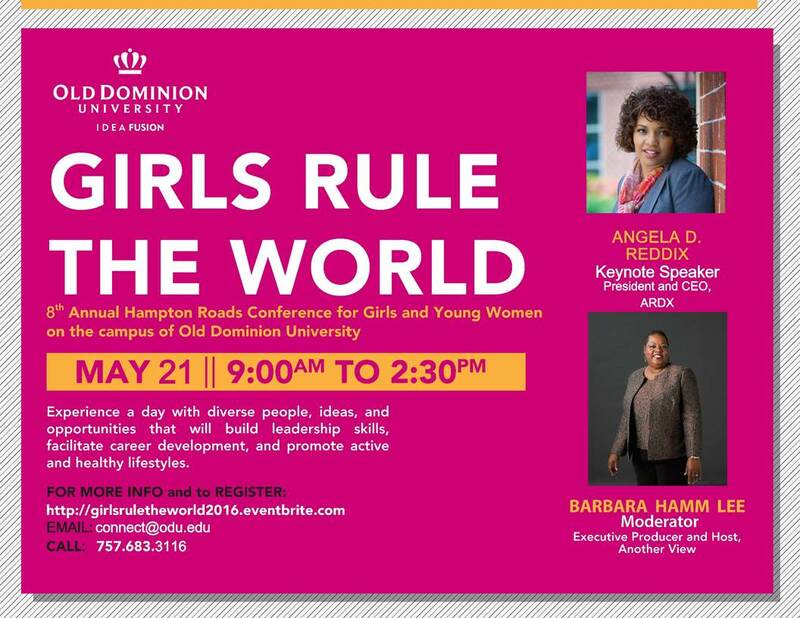 There is still time to register for Old Dominion University's 8th Annual Hampton Roads Conference for Girls and Young Women "Girls Rule the World," on Saturday, May 21, 2016 in the Webb University Center. The daylong conference provides workshops and presentations that are intended to inform and empower girls and young women to become productive citizens and leaders. Last year's conference was attended by almost 400 girls, young women, parents and other interested adults. It was a rousing success and we expect this year's conference to bring an even larger audience! The conference is free and open to all young women ages 10 - 18 and accompanying adults from the Hampton Roads region and beyond. Learn more and register here. Due to low registration for the Public Service Survival Kits on May 22, 2016 this event is rescheduled for November 13, 2016. If you would like to be added to the roster for this new date, email us at support@gsccc.org. Girls' Voices Need to be Heard to Help Make Girl Scouts Even Better! WE NEED TO HEAR FROM ALL GIRLS! You can participate by taking part in two surveys. 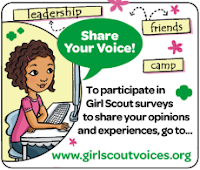 Register at www.girlscoutvoices.org. Each survey will be emailed to you. These two surveys will help Girl Scouts measure how girls have achieved the 15 outcomes of the Girl Scout Leadership Experience over the course of the Girl Scout year. Register here through eBiz. Once you have registered through eBiz, you will receive a link to register for the webinar. Recordings of previous webinars can be found on the Service Unit Resources webpage. For questions, contact Christine Duer, Volunteer Services Director, at volunteer@gsccc.org. Do you like to sing? Do you like to sing Girl Scout songs? Would you like to join the GSCCC Singalong group and travel around the Council to share your passion for singing? If the answer to any of these questions is yes, contact Cheryl McGrenra, Adult Learning Manager, at cherylm@gsccc.org and find out how you can join your singing Girl Scout sisters. Registration is open for Old Dominion University's 8th Annual Hampton Roads Conference for Girls and Young Women "Girls Rule the World," on Saturday, May 21, 2016 in the Webb University Center. Join us for a fun night of baseball with the Norfolk Tides at Harbor Park. If we sell 1,000 tickets, 600 girls will have the opportunity to sleep under the stars on the field at Harbor Park. The game is a family event. The overnight is for girls and the minimum number of adults required to meet ratio only. No drop-off for overnight. Alex Sheen is the Founder of because I said I would, a social movement and nonprofit dedicated to the betterment of humanity. His work has been featured on ABC World News with Diane Sawyer, Good Morning America, the TODAY show, Steve Harvey, CNN, The Los Angeles Times, NPR and many other programs. Alex is a three-time TEDx closing speaker. He has spoken to audiences ranging from middle schools to the world’s largest consulting firm. The 2016 Volunteer Kick-Off is just a few months away, and we need your help in planning the event you want to be part of. Please take a few moments to complete this very short survey to share your ideas. The Kick Off will be held on Saturday, September 10, 2016 at the Old Dominion University Webb Center in Norfolk, VA.
You’ll have the opportunity to visit our community partners and find out what new and exciting programs they can offer your girls, pop in a workshop session where you will take home some nice-to-know information, or chat with someone you haven’t seen in a while. Prices start at $4,465 plus airfare to Boston and a $200 council fee Payment plans are available. In Athens, Florence and Barcelona, you can trace the cultural and artistic development through the ages. Florence reveals the giant leaps of the Renaissance. And in Barcelona, Gaudí’s surrealist work proves there’s no limit to artistic creativity. This trip is open to all Girl Scout Cadettes, Seniors and Ambassadors 14 years and older at the time of travel. For additional information visit this website or email Eileen Livick at queenleen221@gmail.com. Prices start at $4495, plus airfare to Boston and a $200 council fee. Payment plans are available. Introduce your girls to the innovative spirit that kept Germany resilient during tough times and has allowed it to flourish today. Begin in Munich, home to the world’s largest museum of technology and science. Learn about renewable energy and solar power, modern cultivation and ecology in Freiburg. Continue your discoveries in the Lucerne region, where cutting-edge technology finds itself against a backdrop of medieval history. Prices start at $3175 and increase as the trip gets closer. Payment plans are available. Enjoy 10 beautiful days in scenic Costa Rica! Beaches, kayaks, zip lines, volcanoes, white water rafting and much more! Your full-time tour director will lead the group on a tour of schools, hot springs, cloud forest and the National Institute of Biodiversity - a once in a lifetime chance to see the world in a different way! This trip is open to all Girl Scout Cadettes, Seniors and Ambassadors 12 years and older at the time of travel. Adult spaces are limited. Only thirteen spaces left! Prices start at $2,735 for girls and $3135 for adults. Prices increase as the trip gets closer. Payment plans are available. It's never too early to start planning your next travel adventure with Girl Scouts! Join GSCCC for a trip to the Grand Canyon in June of 2018. The trip also includes visits to Zion National Park, Bryce Canyon National Park, the Colorado River and the Hoover Dam, and a Las Vegas Show. Get more information here. This trip is open to all Girl Scout Cadettes, Seniors and Ambassadors 12 years and older at the time of travel. Adult spaces are limited. For additional information, email Eileen Livick at queenleen221@gmail.com. During this community service project, Girl Scouts will make kits to honor police and fire public service personnel. Girls and troops will take their kits to hand deliver to police and fire personnel as they make the world a better place. Police and fire personnel will visit to talk about their careers. This is a girl event. One adult may be asked to stay with troop to meet ratios but does not pay. For registration questions contact support@gsccc.org. Girls will dive into coastal science with a day of STEAM (Science, Technology, Engineering, Arts and Math) activities on North Carolina’s Outer Banks. Girls will learn and interact with local women scientists who are solving global problems facing the world’s coastlines right here in our own backyard. Are you a strong girl? Do you want to learn more about health and the professionals that help us get and stay healthy? Then Strong Girls is for you! Join us for this hands-on learning event at Eastern Virginia Medical School (EVMS). Girls will tour the facility and learn what it takes to attend medical school. Earn hours towards earning your Free Being Me patch*. Ages 7-10 includes dress-up & karaoke. Ages 11-14, includes makeup, nail polish & karaoke. *Patches are while supplies last only. Celebrate friendship and your birthday with us! Party includes friendship bracelets, nail polish, karaoke, and jar of love. Book events online at doveanddaisyspa.com or call 757-529-1101.